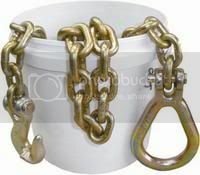 I'll use it between my hand winch and tree protector strap (or other anchor point) to be able to adjust the working distance to the vehicle under recovery. The winch has only 10ft dual line pull (20ft single line). If after the 1st pull i shorten the chain to reposition the winch i can pull another 10ft and so on. Heres mine for a day on the beach. For camping there is more. This thread's still alive? Ok.
That all safely fits into the cargo area of an Outback Sport*, even with the back seat NOT folded down. I'm not sure what it does to my car's mileage, but I do lose about .5 cm of ground clearance. I leave most of this in my car all the time. The water and first aid stuff is temperature-sensitive, and the Pow'r Pull is cumbersome, so I often leave them behind. I bring repetitive items such as all the flat tire equipment and fire-starting devices because I heard tire problems are common when off-roading, and building a fire might be really important some day. I originally planned to REPLACE my compact spare tire with the full-size one, but the full-size one doesn't fit in that storage area. That area gets quite damp (condensation? ), so I continue to keep my compact spare there rather than other cargo. *The fire extinguisher is bolted to the floor near the passenger seat. Last edited by rocky; 16th November 2010 at 10:17 AM.